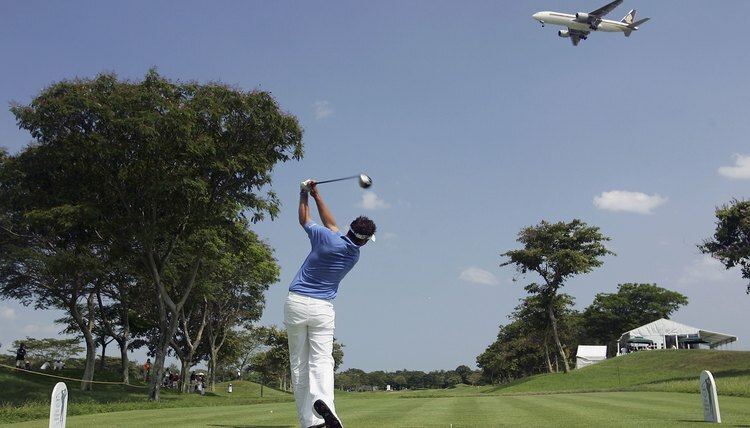 Although this is an actual shot taken during a recent Singapore Masters, you might find it more useful to have your local pro evaluate your swing plane! Plane is one of those terms that gets used a great deal when talking about the golf swing, but can get confusing to the everyday golfer. TV commentators draw multiple lines on their telestrators, each one indicating a different “plane” that influences a player’s swing. But plane is a fairly simple idea that is not too complicated. Ben Hogan was the player who really popularized the notion of a swing plane, and his thoughts still influence most modern teachers. When you swing a golf club, it makes a circle around you. That circle, when viewed down the target line from behind a player, appears to be a tilted line. At its simplest, a plane is a way of thinking about this tilted line. Hogan imagined a large pane of glass with a hole in the center; he then imagined a player standing in that hole. When the player swung his club, Hogan imagined the player’s club skimming along the glass. That glass represented the player’s swing plane. In Hogan’s concept, the edge of this “plane of glass” touched the ground along the target line where the ball sat. The glass was then “tilted” until it rested on the player’s shoulders, with the player’s head sticking out of a hole. The player’s shoulders slid along the bottom of the glass as they rotated during the swing, so the club shaft was “on the plane” when the player’s hands reached the top of his backswing. For Hogan, the correct plane depended on the player’s height. Tall players swing on a steeper or “more upright” plane; short players swing on a shallower or “flatter” plane. Because of this, the correct swing plane is different for every player. Hogan believed that there was one correct plane for each player, and that you needed to swing on that plane to make a good swing. But Hogan also believed that a player’s plane changed on the downswing. When Hogan started his downswing, his spine tilted slightly backward, away from the target. This downswing plane was always a little flatter than the backswing plane. This “two plane swing” concept dominated golf for many years, and many teachers still teach it. Times change, and other competing swing theories have resulted in other ways of looking at the swing plane. Single-plane concepts are based only on Hogan’s backswing plane. Some use two parallel planes based on the position of the club shaft at address, which results in a much flatter plane than Hogan used. Other theories use the path of the hands during the swing, which gives a more upright plane than Hogan’s ideal. However, Hogan’s original idea of a single "shoulder" plane seems destined to endure and, regardless of what other theories are advanced, it remains the “correct” swing plane against which all others are judged.